Home Brewing Just Got Easier and More Exciting with 1-Gallon Recipes Amber Shehan makes home brewing a breeze for beginners and experts alike with smaller 1-gallon (3.8-L) recipes that reduce the time, money and energy needed to create delicious brews all year long. Enjoy the nuanced flavors of homebrews like tart Orange-Hibiscus Cider, palate-cleansing Peppermint Wine or soothing Vanilla Bean and Chamomile Mead. As an herbalist, Amber showcases her knowledge of culinary and medicinal herbs, wildflowers and plants in this incredible collection of deliciously infused brews that are both intoxicating and tonic. Rosemary and Clementine Mead is the perfect refresher for a warm summer evening and Spiced Pomegranate Wine will warm you right up on the coldest of winter days. With inventive, potent recipes and all the brewing know-how you need to get started or build your skills, Artisanal Small-Batch Brewing is your go-to guide for creating memorable brews beloved by all. 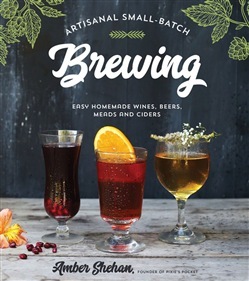 Acquista Artisanal Small-Batch Brewing in Epub: dopo aver letto l’ebook Artisanal Small-Batch Brewing di Amber Shehan ti invitiamo a lasciarci una Recensione qui sotto: sarà utile agli utenti che non abbiano ancora letto questo libro e che vogliano avere delle opinioni altrui. L’opinione su di un libro è molto soggettiva e per questo leggere eventuali recensioni negative non ci dovrà frenare dall’acquisto, anzi dovrà spingerci ad acquistare il libro in fretta per poter dire la nostra ed eventualmente smentire quanto commentato da altri, contribuendo ad arricchire più possibile i commenti e dare sempre più spunti di confronto al pubblico online.